WELCOME to my original paintings outlet! Since 1981, I have been serving art collectors with my original fine art paintings of U.S., France, England and Italy. Thanks for visiting, and happy shopping! Quality and customer service are top priorities, so if you have a question please don't hesitate to contact me! My objective for this booth is to offer among the best of my works at a reasonable price. Hopefully they will find a home with you! Impressionistic and representational American and European landscape & still-life paintings; in acrylic, pastel, and oil, by renowned American artist. 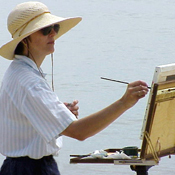 Diane is a well-known artist and instructor, is a full-member of the prestigious Pastel Society of America; signature member of the Great Britain National Acrylic Painters' Association; and member of the National Academy of Professional Plein Air Painters. In 1988 as one of the top 100 emerging artists in the U.S. by American Artist, was rated as one of the top 10 "Best Buys" for investment art by The Roanoker magazine in 1990, is listed in the Who's Who in American Art and Who's Who in the South and Southwest. In 2000, she was invited to be a part of the first ever, White House Conference on Arts and Humanities. L. Diane Johnson, painter, lecturer, writer and instructor has been painting professionally since 1981, first as a classical portraitist and now paints landscapes en plein air (in the open air) and from her studio. Her focus is in the area of gardens, architecture and the open landscape to capture the intimacy of each location and moment in time; her media are acrylic, soft pastel and oil created in the U.S., UK, CA and Europe. "FOR YEARS I have enjoyed painting client portraits, still life and landscapes from my studio. However, in recent years I have discovered the incredible experience of capturing landscapes through "en plein air" or open-air painting. In addition to painting all over the US, I've had the opportunity to paint abroad in France, Italy and the United Kingdom. The experience has been nothing short of profound. The landscape comes alive, as I work to capture the light that redefines the scenes before me. As the instructor of several plein air workshops held in Claude Monet's Garden in the village of Giverny, I can understand why Monet painted in this one place for the last 40 years of his life and still could not exhaust its enduring beauty. Each time I step outside, I am even more filled with the wonder of what God has created around us, for us. It is to Him that my art is dedicated." PleinAir doesn't have any items in their booth!